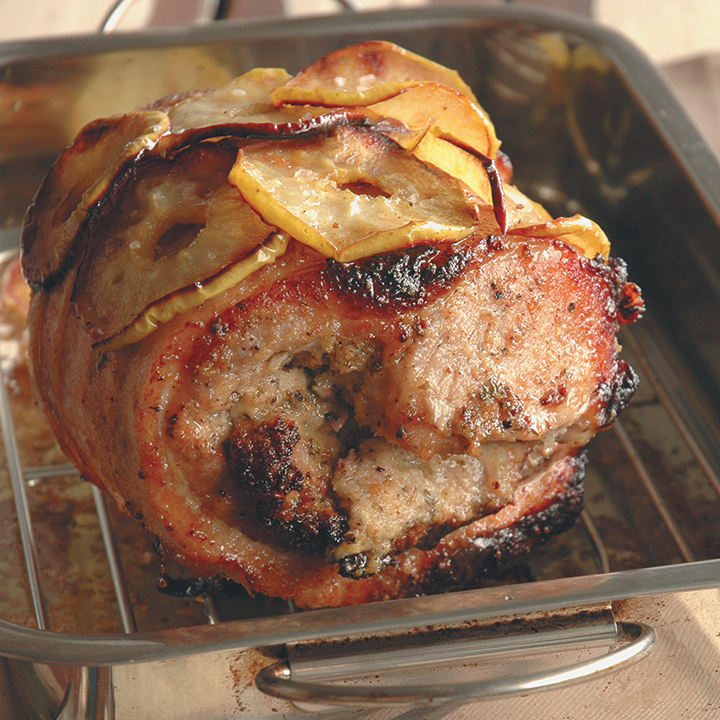 A variety of flavours emerge from the stuffing to combine with the delicate flavour of pork. For the stuffing, put the breadcrumbs in a mixing bowl and add the butter. Cream until well combined. Stir in the remaining ingredients. Place the stuffing in the middle of the loin, roll up and secure with string. Mix the glaze ingredients together, rub all over the skin and place the loin on a rack in a baking dish. Cover with foil and bake for about 40 minutes, then reduce the heat to 180°C and bake uncovered for about 50 minutes. Remove the skin from the pork, gently place the apple slices on top and roast for 10 minutes. If you prefer, leave the skin on and grill for 2 minutes to make crackling.